In the days before Christmas 1964, Terry Nation was formally commissioned to write a serial which was, for a long time, known simply as “Dalek Three“. This was the story that be re-titled The Pursuers before ultimately becoming The Chase – a story which would bring back the Daleks in order to satisfy a public which clearly had a large appetite for the metal creations. The story which preceded The Chase was The Space Museum and it featured Dalek One in three of the four episodes (albeit briefly each time). The first was in a minor role as a dead casing recorded on 2nd April 1965 and the second would be shot a week later for episode two. However, there were additional plans for that same day which would see some major developments in Dalek prop history. Production at the time was essentially “double-banking” with work on The Chase and The Space Museum taking place simultaneously. Not only that, but the big-budget feature film Dr Who and the Daleks was being shot at Shepperton at exactly the same time, meaning three Daleks-related productions were under way at once, all using props prepared by Shawcraft. For The Chase, Ray Cusick was assigned as designer once again, allowing him creative control of his creations for a second time. Spencer Chapman had added dishes to the backs of the Daleks to account for their increased mobility in The Dalek Invasion of Earth, but Cusick felt that he could do better and so drew up a design for a solar panel arrangement of slats around the shoulders. Cusick also indicated that the props should be reverted back to their smaller stature and gave instructions to remove what Chapman had called his “hovercraft base”. On the same day that William Hartnell was scheduled to be recorded hiding inside a Dalek prop for The Space Museum, the first shooting for The Chase was planned to take place at Camber Sands on 9th April 1965. This was for the cliffhanger of episode one and the scenes in episode two showing the Daleks exploring Aridius. For this location work, two silver props were required. 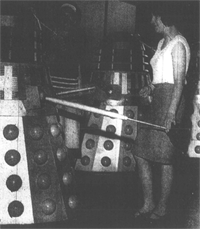 Dalek Three and Dalek Four had been given to Dr Barnardo’s in 1964, which left four casings in the hands of the BBC. 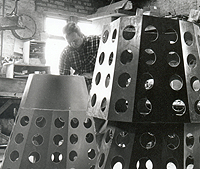 Dalek One was busy in studio recording The Space Museum, and so the remaining three were taken to Shawcraft for refurbishment in early April 1965. These were Dalek Two, still painted black, plus the pair built for The Dalek Invasion of Earth, being Dalek Five and Dalek Six. The latter two has suffered severely during their publicity work and their lower collars were particularly badly damaged. The trio arrived at the Shawcraft workshop about a month after the company had had their services called upon to provide a brand new set of props for the AARU film Dr Who and the Daleks which was at this point mid-way through filming. The new processes and slightly different components necessitated by the large batch of film props meant that Dalek parts, and indeed whole new casings, were now considerably easier to make than when the first props had been build two years earlier. Despite the original TV props costing less than £250 each versus the film Daleks averaging £3002, it has to be factored in that the film Daleks had additional requirements. The AARU props had costly, solid fibreglass fenders, they had three pincer attachments made, plus internal fire extinguisher fittings and the custom blowtorch-Dalek apparatus. Dalek Five and Dalek Six, the newest TV props, were provided with new lower collars to replace those which could be seen badly mangled at the Girls and Boys Exhibition. The new collar for Dalek Five is notably less shiny, just like the diffuse matt appearance of the film props. The screws holding it place are also mounted higher. The screws on the new collar are Dalek Six are extremely high, as per the majority of the film props. 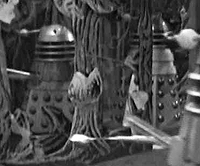 During this story, the skirts of these two props were also swapped over, so the top half of Dalek Six and the bottom half of Dalek Five were paired, and vice versa. 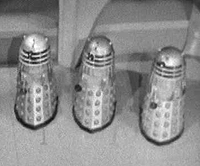 Dalek Six, which was previously characterised by its tapering upper collar (now replaced and hidden by slats) has new distinguishing features on its shoulders. Between the front two slats there is an inverted V-shape taken out of the mesh, and its slats R1 and R2 are less than half the distance apart that they should be. Combined with the tall, rectangular patch inside the arm-box, it makes this prop easy to tell apart from its fairly unremarkable counterpart. Whilst Dalek Five and Dalek Six had good condition shoulder structure and damaged collars, Dalek Two – the Black Dalek – suffered the opposite problem. Its collars were in surprisingly good condition but it had particularly badly-damaged gunboxes. The solution to this was to transplant a new set of fibreglass boxes from the movie mould. The process introduced some small changes to the front area of the shoulders – the inside edge of the arm-box was smeared in filler and appeared rather untidy and two new small holes appeared on the inside edges of both boxes. Since the collars were in good condition they were refitted and slats and mesh were attached to the top collar as per the other props. 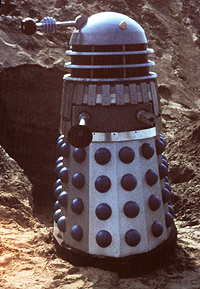 Despite the change of gunboxes Dalek Two retained its distinctive “lifted” appearance at the front of the lower collar. There is an important feature which appears in the new gunboxes that sets it apart from genuine movie Dalek boxes and becomes useful in future for demonstrating that some prop components, despite having the angles and measurements associated with Daleks from the films, were never made for that purpose. The new gunboxes of Dalek Two have a smaller, inner lip within the holes that hold the limbs’ ball-joints. This double-staged socket means that the ball joints are set deeper inside the casing than on TV shoulders. Although this feature is seen on at least one film prop its to a much, much smaller extent. 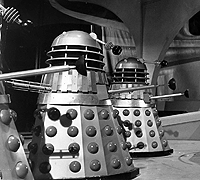 The three props had their eye-balls returned to black, having been silver for The Dalek Invasion of Earth and, most importantly, each of them was fitted with Ray Cusick’s new solar panel arrangement of slats over the upper collar area. All three props had their paint jobs touched up, and all were given a new, darker blue as their hemisphere colour. Dalek Two was also repainted silver in readiness for the first studio work which required three silver props for a battle with the Mechanoids. One element of Dalek prop history which has been misunderstood for years is the myth that movie Daleks were converted for use in the TV series. Glimpses of flat-top gunboxes, misaligned hemispheres and other clues have lead to all sorts of inaccurate conclusions being drawn about where certain Daleks came from. But, as noted above, any work done by Shawcraft after February 1965 was in the wake of the movie-style techniques that had been developed. Researchers in the past have made the easy mistake of assuming a movie-style-component is therefore of movie-origin. And with this in mind, we turn to the Dalek which has caused more confusion than any other in Dalek history: Prop Number Seven. It must be noted that shooting of the film Dr Who and the Daleks was taking place up until 23rd April 1965, however Shawcraft’s refurbishment work on the first three The Chase props took place several weeks before this date, in early April. 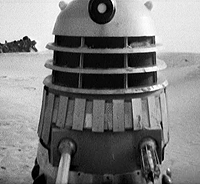 For the TV serial, two props were needed for the first location recording to be done at Camber Sands on 9th April (whilst the movie was still shooting) and for this footage set on the desert planet of Aridius, Dalek Five was used alongside a newly built prop. Dalek Seven looked at first glance like a TV Dalek, complete with solar panel shoulder slats, but it was built with the new techniques that were the legacy of the film props. For this reason, the gleaming casing seen on the dunes of East Sussex had all the nuances of a movie Dalek, despite never having been involved in the movie. It had steep-sloping neck rings, it had flat-top gunboxes, and it had badly-aligned hemispheres. 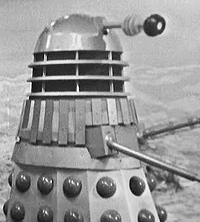 It does however, have the deeply sunken double-staged gunbox sockets (similar to Dalek Two’s) which were unique to the shoulders built for television. The reason Dalek Seven did not need any of the usual internal workings was because its primary role in The Chase was one of ‘the fall guy’. Part of the reason confusion has always surrounded the nature of this prop is that its appearances in the serial are fleeting and where it does appear, its fate is unenviable. The previous Dalek serial had featured a Dalek emerging from the Thames, and the plan for The Chase was for the evil aliens to return by emerging from the dunes. 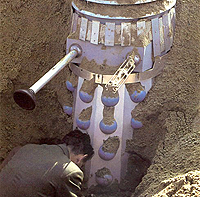 Therefore, the first use that was ever made of Dalek Seven was when the production team attempted to bury it in sand. It was intended that the prop could be pulled from its position via a Land Rover, but the weight of the sand made it impossible to move and the shot was abandoned. After this failed plan, the crew at the beach filmed shots of the casing being “walked” across the dunes, and model work would later be used to created the shot of the Dalek buried in sand. Three days later, after the prop had been cleaned up, it then took part in the pre-recorded water-tank scene for the Mary Celeste sequence. This was the only occasion that Dalek Seven can be seen in a normal role, as it bumps and jerks around a corner pursuing the captain (revealing the only clear shot of its misaligned hemispheres) before falling through the ship’s balustrade into the “sea”. 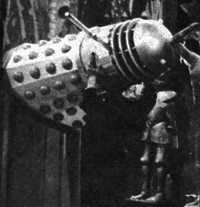 The final scene for which this “stunt-Dalek” was used was a month later once the production was in full swing in the studio. On May 21st, the battle-weary Dalek Seven was carried into the studio and positioned ready to receive the wrath of a robot. 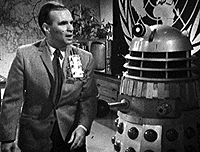 The episode Journey Into Terror featured a robotic Frankenstein’s monster along with other mechanical fictional characters, and it seemed the Daleks had met their match. In an extraordinary feat of strength, actor John Maxim lifts Dalek Seven over his head before crashing it onto the ground, and then continuing to pound at the prone creature. The impact with the studio floor breaks the entire corner off the rear-right section of the fender. This “stunt-Dalek” casing did lack some internal workings but its weight should not be underestimated! One noteworthy element of this appearance is that its gun now lacked the standard octagonal spoke arrangement seen on the TV props, and was replaced by a standard movie style gun which had a larger bore. Having performed its final stunt at this stage, Dalek Seven was not used for the rest of the serial’s recording. On 15th April, the three props which had been refurbished at Shawcraft (Dalek Two now painted silver, and the newer Dalek Five and Dalek Six) took part in the final battle with the Mechanoids. Dalek One was not available for this sequence because it had only just completed its recording of the second “dead Dalek” cameo for The Space Museum episode two, and as such it was still in its Dalek Invasion of Earth guise. Therefore, around the time the remaining props were waging war on Mechanus, Dalek One was sent to Shawcraft to have its solar panels fitted in order to complete a set of four identical props. However, with the others not present, it was easy to overlook one distinguishing factor which remained untouched. Dalek One’s silver eye ball remained intact and thus stood apart from its black-eyed brethren. Dalek One‘s refurb was completed with slats being attached to the shoulders, and was returned to studio TC4 for recording of its third and final appearance in The Space Museum on 23rd April, where it appeared as a functional Dalek once again, speaking to its superior via a wall-communicator and creating the cliff-hanger to segue into The Chase. The following Friday 30th April, all four props were finally united in studio once more for recording of episode one of The Chase. 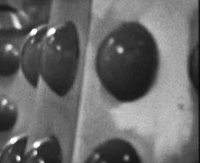 The Daleks’ only appearance in this episode was on the Space Time Visualiser, whereby the Doctor and Barbara were able to spy on a Dalek control room. For this, Dalek Two had its dome and skirt painted back once more to function as the Dalek Supreme. On this occasion, a water-based paint was used so that it could be easily washed off following the brief appearance as a leader class. When episode two was recorded a week later on 7th April, the water-based paint did not come off as effectively as hoped, and Dalek Two retains blotchy dark smudging on its silver paintwork for the remainder of the serial. For episodes two, five and six, Dalek Five is fitted with a Seismic Detector to help the Daleks locate the time travellers. Its solar panel R8 becomes is broken early on. This prop’s top half is also swapped with that of Dalek Six from time to time so the skirts are occasionally mismatched. The solar panels of Dalek Six also received a lot of damage and in due course L4, L8 and L11 are snapped. 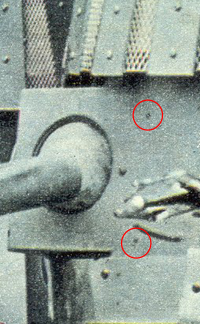 As well as its silver eye making it unique, Dalek One had had nothing done about the four large holes in the rear of the dome which had been left over when the hinge apparatus was removed half way through recording The Space Museum. The four holes can be seen on a number of occasions but are particularly clear in the Mary Celeste scenes in episode three. Between episode three being recorded on 14th May and then episode four on 21st May, Dalek One had its eye quickly painted black to match its counterparts. As was often the case in the long history of prop refurbishment, the modification was only half-hearted, and due to the paint being matt instead of gloss, this eye-ball still stands out as different to the others even once they are all black. After shooting of the feature film was concluded on 23rd April, all the Movie Daleks became available for other uses, at which time The Chase was in production. Since they were owned by AARU, the BBC had to pay for their use. The expense meant that only three props were hired, and these appeared at the Riverside studios on 14th May for episode three of The Chase. The props which arrived at the BBC were AARU Five, AARU Six and AARU Seven – the three drone props from the film that had suckers which matched their television counterparts. AARU Five‘s distinctive pushed-back neck can be seen to the right of the ramp in the Dalek time machine. AARU Six is on the other side of the ramp with AARU Seven to the far left of the set and only partially seen in the finished episode.. The fact that three genuine Movie Daleks did play some part in the recording of The Chase has helped fuel the incorrect notion that the AARU Daleks became converted and absorbed into the mix of TV props. But, as seen on set, the film props that were used had no major modifications, although a new set of smaller light covers was fitted to each prop. Unfortunately, with no additional Dalek operators hired, and with the tall fenders removed to reduce their height, the static appearance of these movie props is somewhat conspicuous. Three days after recording episode three, a dozen of the Movie Daleks including some dummy extras were driven to the South of France to appear at Cannes. The props taken abroad were Black AARU One, Red AARU Two, the blowtorch AARU Eight, and blue drones AARU Three and AARU Four. This left the remaining three hero props used in episode three of The Chase to make a further appearance in episode five. 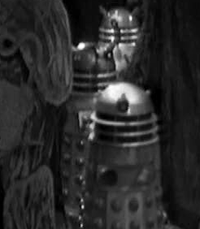 Recording of the penultimate instalment took place on the afternoon of May 28th – coincidentally the final day of the Cannes Film Festival – and when three Daleks advance on the time-travellers in the jungle, it can be noticed that two Daleks aren’t actually advancing, due to being static Movie props. This time their fenders were used making them appear much taller, and their normal lights had been restored. 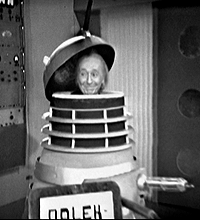 For episode six Dalek One was fitted with a Electrode Unit to gain entry into the Mechanoid City. This was a satellite dish-like attachment which was spun by the operator when required. The following month all the Movie props were back together in the UK as part of the major publicity campaign and national tour to launch Dr Who and the Daleks. 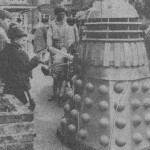 Those props that had appeared in The Chase were used as competition prizes, eventually being taken home by two lucky young boys. The Chase had begun broadcast on 22nd May and concluded on 26th June in an episode in which 9.5m viewers saw companions Ian and Barbara leave the TARDIS. After recording of The Chase had finished, a busy summer period of activity would follow. The Kent Messenger newspaper arranged with the BBC to borrow four Daleks for a week long invasion of the Kent area! Dalek Seven in Uxbridge. Click for a larger view. A model spaceship completed the display and visitors were also given a leaflet explaining how to make their own Dalek4. Shawcraft Models were slowly gaining some local notoriety themselves at this time. 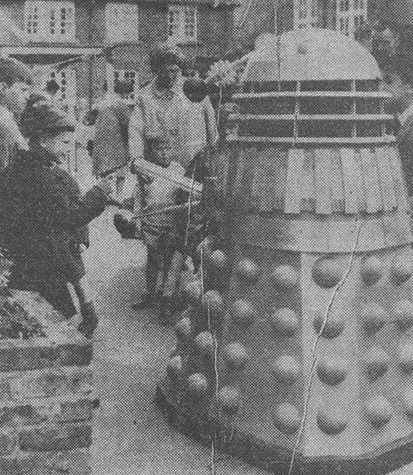 Local newspaper articles had appeared whenever they had the Dalek props back for refurbishment and so it wasn’t long before they themselves were loaning Daleks out for fetes. Dalek Seven at the Southall Carnival. Click for a larger view. 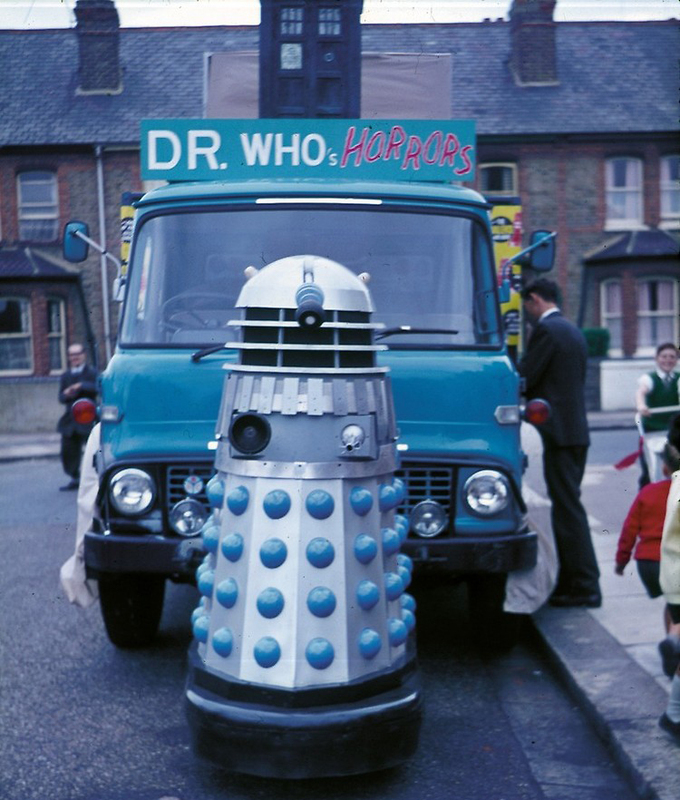 Dalek Seven was also the star when it appeared at the Southall Carnival as part of a Doctor Who themed truck provided by Shawcraft. It was temporarily fitted with a large ‘Dalek Invasion of Earth’ fender and mounted on the front of the truck on a specially made bracket. On the back of the truck a menagerie of monsters and props could be seen and included the TARDIS model, the console, Zarbi and a Mechonoid. The truck also carried adverts for the ‘Dr. Who and the Daleks’ movie showing at the local cinema. A short time later, the Daleks made a brief cameo in a sketch alongside Canadian comedians Johnny Wayne and Frank Shuster. Highly acclaimed in America and frequent contributors to the Ed Sullivan show, they also made numerous appearances on British television, including their own Wayne and Shuster Show. It was in one of these BBC-produced shows that Dalek Five appeared in a sketch called The Machine that Conquered the World. The sketch was recorded on 12th July and broadcast 4th September. The prop was operated by Brian Hands. Several other props from Doctor Who were also featured. 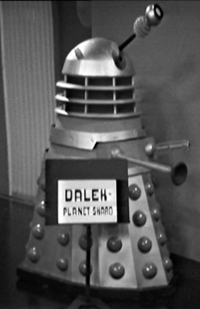 Dalek Three also made another public appearance in the summer of 1965. Having last been seen at the Access Equipment Christmas party in 1964, it was now due to be part of the street parade carnival held in Birchington-On-Sea which had been held in the town since 1932. The prop was loaned from Barnardo’s and was now looking somewhat more distressed in the few months since Christmas. The lights had been changed and some form of tape had been wrapped around the lower neck area but it was possibly the eye that had suffered the most. The discs had been damaged and the silver paint was coming away from the eyeball. There was also tape holding the stalk to the pivot. Interestingly it did still retain its solar dish from The Daleks Invasion of Earth. 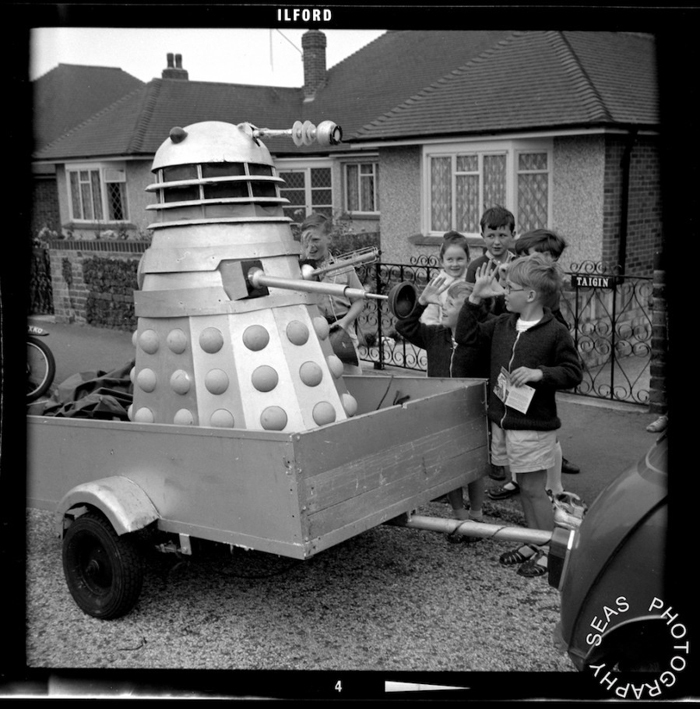 Despite the state of the prop, it was still a big draw for children and it was photographed getting ready for the parade in Essex Gardens in Birchington. 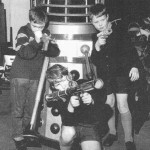 Dalek Four with children armed with ‘Anti-Dalek’ toys. Click for a larger version. 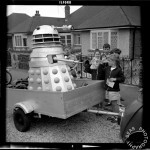 Barnardo’s second Dalek, Dalek Four, also made another appearance around this time. It had also suffered since the Access Equipment Christmas party, with its eyestalk and lights now broken off. A new plate also had been screwed to the front of the gunbox making it appear wider. The hemispheres had been painted black since its last appearance. 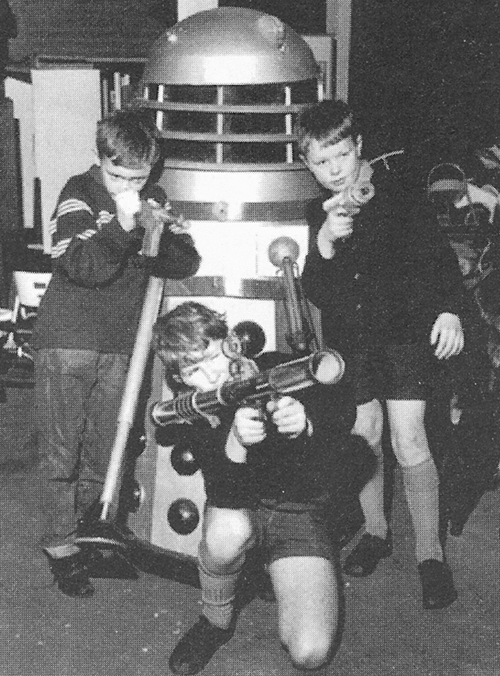 The prop was pictured with thee children who were promoting the latest ‘Anti-Dalek’ toy guns. From the state of the prop it could be construed that the toys actually worked! With the Daleks still such a phenomenon, Terry Nation was keen to find a way to exploit his conceptual rights over them without the BBC. He made two attempts towards the end of 1965, and the first formed part of a TV serial which would stretch the public’s tolerance for the Daleks to breaking point. According to a note at the BBC written archive – Thanks to John Kelly. Ray Cusick recalled that the original batch of four props had to cost less than £1000. Archive material indicates the eight hero props for the film cost £2800. Shots from episode four clearly show the inside of the dome, with no additional apparatus for the operator. The up-turned skirt also reveals no wheels are fitted.